Did you know you can launch a file directly into its default app, right from a Quick Look preview on Mac? And you can open the files from Quick Look preview into other compatible Mac apps too. 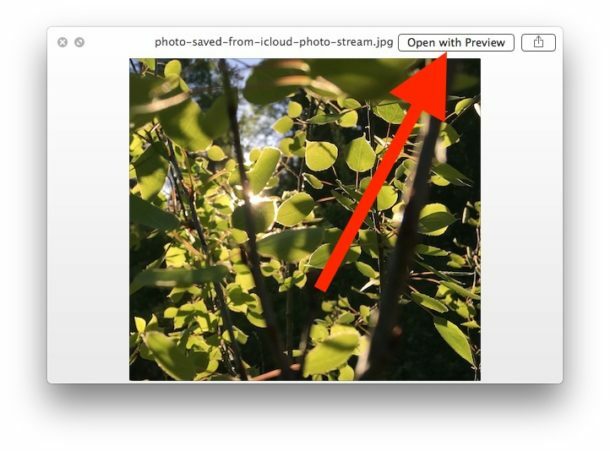 Quick Look in Mac (from Mac OS X Lion and later) includes a “Open with [Application Name]” button in the upper right corner of the windows, that makes it nice and easy to quickly open the file you are quick looking into the app it defaults to be associated with. By the way, the recommended app in ‘Open with App Name’ will be the same as the default app associated with that file type on the Mac, which you can change that if you want to. But you’re not limited to launching the file in only that app that is shown in the corner. Right-Click on the suggested application name to show a contextual menu where you can select to open the file in another compatible app, this menu is very much like the Finders “Open With” menu that pops up with right-click. If you’re not familiar with Quick Look, select a file or folder in the Mac OS X Finder and then hit the Spacebar. The resulting window will give you a preview of images, text and pdf documents, and more. Quick Look is also further customizable through third party plugins.